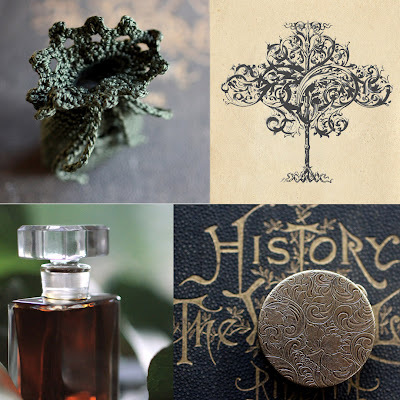 This page has been created to list all the reviews and testimonials that come in for Hedera helix, the new, green chypre natural, botanical perfume for Ivy, one of the sacred plants of the Celtic forest and part of the Tree Ogham. Get your sample set here. "I have been rolling in Hedera Helix ~ sweet green chili peppers surrounded by leaves of ivy and oakmoss and lightly sprinkled with powder. Um, am I crazy? Absolutely love this perfume!!!" "SOTE: After a hot shower, the wonderful new Hedera Helix in solid perfume from Roxana Villa - a green lover's idea of paradise, and so calming too. Aaahhhhhh.... :-)"
Roxana Illuminated Perfume Hedera Helix: Wouldn’t you love to receive the lovely compacts pictured above? I certainly would as they’re filled with Roxana Villa’s newest fragrance, Hedera Helix, an olfactory ode to ivy. Not surprisingly, this perfume is a leafy green chypre that has a dense and addicting note of oakmoss as its foundation. Both incarnations of Hedera Helix, solid and liquid, are a complex blend of nearly forty different essences, but I prefer the solid’s focus on the effervescent top notes of clementine, orange blossom, and grapefruit. (The liquid is much more resinous and inky and also very beautiful). The heart is full of warm beeswax and woods and the drydown is dappled with sweet rose and jasmine petals. I find this progression from chypre green to pale pink to be quite compelling and all together lovely.